Black Holes: Space Warps & Time Twists Harvard-Smithsonian Center for Astrophysics « Jeff Kennedy Associates, Inc. Visitors become “black hole explorers” as they join the search for real black holes—the most mysterious and powerful objects in the universe. An appealing combination of hands-on physical models, immersive experiences and computer-based investigations support a central experience—a fantasy journey to the black hole at the center of our Milky Way galaxy—that makes a difficult and complex subject highly accessible. Signing in, visitors choose a nickname and take a digital picture or avatar image to create their own Black Hole Explorer’s Card. 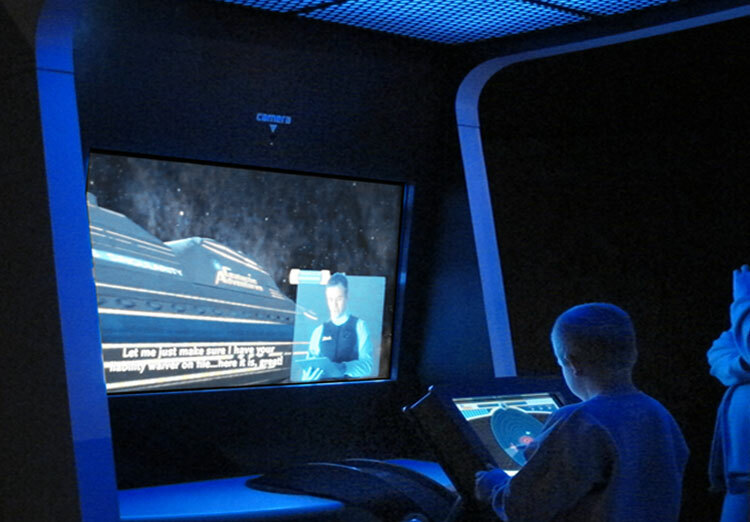 At other stations, they use the card to collect discoveries and generate a personalized website only they can access. Part personal diary, part observer’s log, the website stores data recorded by the visitor. 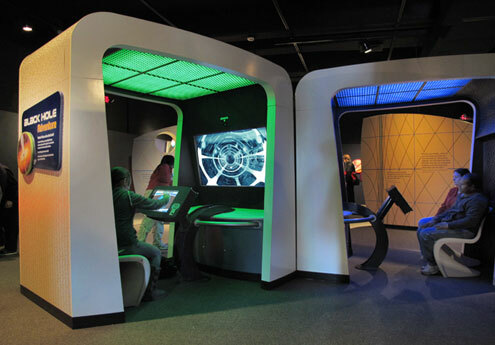 In an immersive ‘excursion pod,’ visitors embark on a fantasy cruise to the black hole at the center of our galaxy, where they explore the phenomena around it, including warped space, the slowing of time and the dangerous magnetic fields and radiation that could leave them stranded on their cosmic adventure. 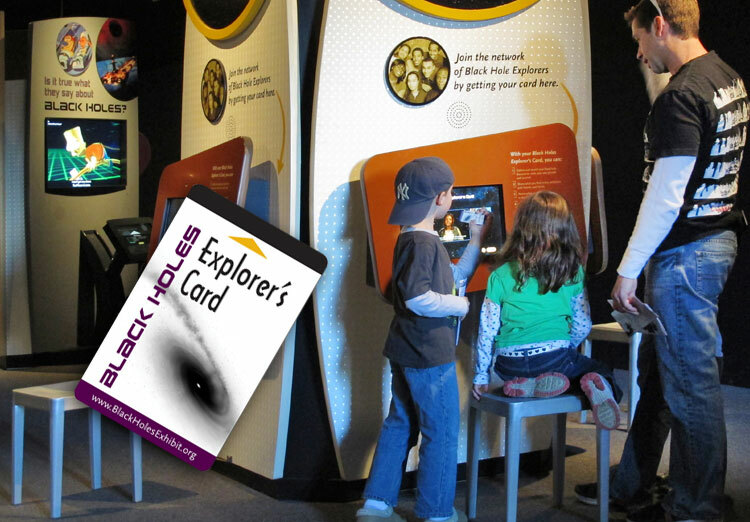 Venturing to the event horizon of a black hole, visitors track an alien spacecraft, launch weather, time and camera probes, and record videos and audio observations for review on a personalized web page. Got Gravity? 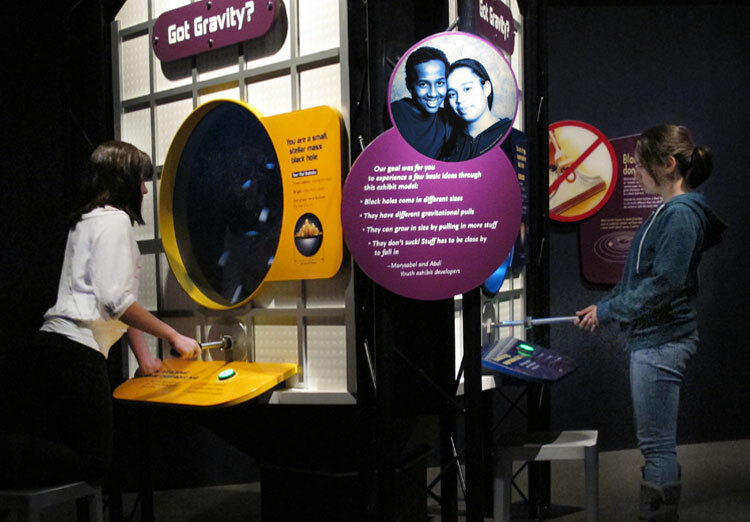 is a multi-user, hands-on activity that brings home a key message of the exhibition—black holes grow by eating matter, and larger black holes can eat more matter than smaller ones. 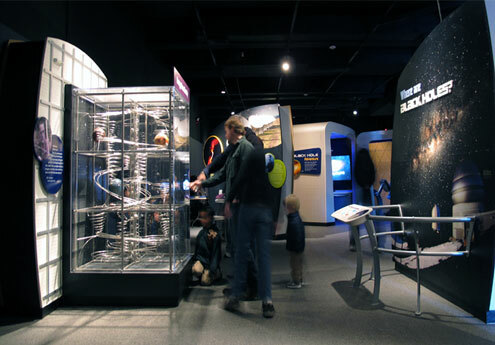 Visitors control different-sized nets (representing the event horizons of black holes), competing to capture the most lightweight foam nuggets swirling inside an enclosed box. Throughout the project, we mentored and collaborated with Youth Exhibit Developers who proposed concepts, built and tested their own early version prototypes, and also appeared in exhibition videos and graphics. Got Gravity? (pictured here) is an example of an advanced prototype we constructed with considerable input from the Youth Exhibit Developer team. 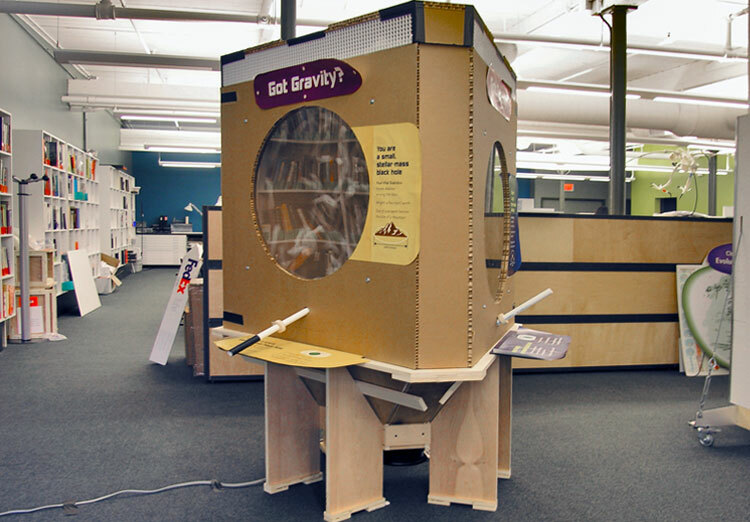 Bringing a physical presence to what is necessarily a media-intensive experience, this crowd-attracting Gravity Ball Machine takes its inspiration from the fact that gravity near a black hole works the same way it does on Earth, but on an extreme scale.